Amateur Innovators - This Is Your Century! In the seventeenth through the nineteenth centuries, the amateur was king in many fields. Early breakthroughs in chemistry, medicine and particularly astronomy form the foundations of modern science. These talented amateur scientists often made their own instruments, or had them fabricated by local craftsmen. But in the twentieth century, the talented amateur was slowly replaced by university-trained PhDs who were hired to build and maintain extremely expensive instruments. However, according to a new report by Charles Leadbeater and Paul Miller, the 21st century could mark the return of the talented (and obsessed!) amateur to the first ranks of science. This is a fantastically useful and interesting observation; this observation could be as important as the ideas in The Structure of Scientific Revolutions, published in the 1960's by Thomas Kuhn. 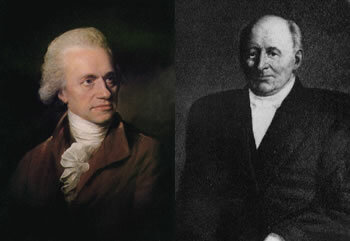 For example, in the late 18th century, William Herschel became interested in astronomy, and pursued the construction of larger and larger instruments while maintaining his career as a singer. In 1781, he discovered the planet Uranus, the first new planet discovered since ancient times. He became a celebrity, and (further demonstrating his acumen) he named the planet Georgium Sidum, after King George III. He was made "King's Astronomer" and recieved a pension for life. He and his sister continued their observations, working on double stars (proving that gravitation worked outside the solar system), an evolutionary system of the universe, developed evidence that the sun put out energy outside the visible spectrum, and started the study of the effect of the sun on the earth's weather. Amateur astronomer Heinrich Schwabe ran his family pharmaceutical business in the early 19th century. In his spare time, he tried to discover planets within the orbit of Mercury. In doing so, he accumulated many drawings of sunspots, trying to find a planet making a transit of the sun. He never discovered a planet, but his seventeen years of nearly continuous sunspot observations demonstrated a ten-year periodicity in sunspot activity - the sunspot cycle. He was awarded the Gold Medal of the Royal Astronomical Society in 1857. Look all around you for examples of the important contributions of amateurs to science and world culture - linux, amateur music remixes, The Sims, and specialized blogs and websites. Yes, even amateur astronomers are making a comeback - the charged couple device (CCD), a light-sensitive chip that can capture starlight and is inexpensive enough for ordinary individuals, is revolutionizing amateur astronomy. And people who know nothing about it can use the SETI@home screensaver, which allows the SETI (Search for Extraterrestrial Intelligence) program use idle machine cycles around the world to analyze data. As for the tie-in to science fiction, take a look around on this site to see some of the remarkable inventions of talented amateurs - science fiction writers. For a start, take a look at waldoes, geosynchronous telecommunication satellites and computer tapeworms. The original story was taken from Amateur Revolution; get your own copy of the report (when it comes out in November) here. From Heinlein to Moravec to MacLeod - bush robots are cool.